In 1873, a Builder’s Merchant and Ironmonger going by the name of Jesse Carter bought a near derelict pottery in the town of Poole, Dorset. Jesse had already realized that there was a large deposit of clay just to the north of the town, and an excellent means of transporting his goods out, and his fuel in, through the harbour. By the 1880’s the factory was well known for its tiling products, mosaic flooring and advertising panels. A rival pottery in the same area was based at Hamworthy and known as the Patent Architectural Pottery. The Carter pottery rapidly overtook the Hamworthy factory in quality and quantity, and in 1895 the Carter family bought the competition for £2,000. The next significant occurance was in 1901 when Jesse Carter retired. Upon his retirement he handed over control of the potteries to two of his sons, namely Charles and Owen. It would appear that Charles was the ‘managerial’ type and Owen was more of a ‘hands-on’ artist. Another name worthy of mention in the following period of twenty years or so, is James Radley Young. Young was the head of the Design Department and his influence doubtless helped to put Poole Potteries where it is today. The period between 1901 and 1920 saw countless coming and goings of the Carter family involving sons, uncles, brothers and the like, and the First World War did not do much to help the situation. But the Carter Company prospered and distinctive styles were beginning to emerge. 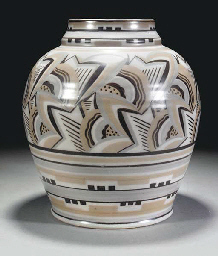 Pictured: A CSA Vase Probably Designed By Truda Carter, C.1930. Impressed Hexagon And Incised Marks 30Cm. High. 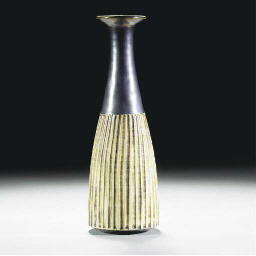 Sold for £7,768 at Christies, London, March 2004. Image Copyright Christies. In 1920, Charles Carter introduced Cyril, his son, to one Harold Stabler, who in turn had Cyril shaking hands with John Adams. Stabler was a designer and silversmith, and Adams a designer and potter. Of as much interest was Adam’s wife, Truda, who was to be a huge influence over the following years. In 1921 the company of Carter, Stabler and Adams was set up as a subsidiary of the Carter Company to produce ornamental and domestic pottery. We should bear in mind that at this time the Carter Company was primarily concerned with the manufacture of tiling and architectural products. Carter Stabler and Adams (CSA) set to with a will and, with a lot of input from Truda Adams introduced a range of hand decorated, bright and vivid designs. The items produced in the 1920’s and 30’s are the most sought after today. The range was impressive to say the least. Decorative tiles, stoneware, vases, urns, jugs, bowls, plates, dishes and so on. They were produced in a huge r ange of colours, decorations, and finishes. 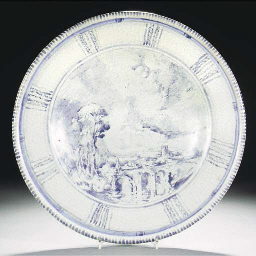 In addition Harold Stabler and his wife Phoebe introduced a faience range and a whole series of figures and plaques. We see the introduction of the range known today as ‘Traditional’ with many design variants. Sometimes the novice Poole collector will confuse the two letter pattern code under the base of a piece with the initials of the artist. Given time and experience it becomes easy to recognise the difference. Pictured: A Carter’s Charger Probably Painted By James Radley Young In The Bloomsbury Style, 1914-21. (Crazing) 42.5Cm. Diam. Sold for £2,271 at Christies, London, March 2004. Image Copyright Christies. In parallel with the highly decorated wares, CSA also made a range of tableware. The first range was Studland designed by Stabler and produced in about 1930. However, this was soon superceeded by Purbeck and then in 1935/6 the Streamline range. As the Streamline range was being developed, and possibly more importantly, CSA developed a two-colour decor scheme. Known around the world today as ‘Twintone’, it gave the CSA tableware a distinct and recognisable character. Possibly the most desirable pieces made during this period would be the ‘Ship Plates’. Rumour has it that the artists decorating these plates could look across the harbour and copy the real thing which would be laying at anchor. As the ‘General Wolf’ a Newfoundland Trader was built in 1797 it seems doubtful that it would be in Poole harbour being painted in 1939. In truth they would appear to be based on a series of drawing by Arthur Bradbury. The ‘Ship’ Plates from the 1930’s are highly desirable and keenly sought after. Pictured: Harold Stabler For Carter, Stabler & Adams ‘The Galleon’, Designed Circa 1925 Modelled At Sea In Full Sail On A Shaped Rectangular Base, ‘The Harry Page’ Moulded To The Side Of The Bow (Chips), 20½In. (52Cm.) High. 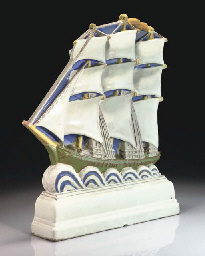 This Model Was Adopted As The Unofficial Symbol Of Poole Pottery And Featured At Exhibitions, In Catalogues And Advertisements During The 1920s And 1930s. Sold for £1,200 at Christies, London, April 2007. Image Copyright Christies. Post war production was based almost entirely on the pre-war designs, with the notable introduction of contemporary ‘freeform’ pieces designed by Alfred Read and Guy Sydenham in 1953/4. As these ‘freeform’ pieces were hand thrown and hand painted, it would be fair to say that each of them is a one-off. They are sought after by collectors the world over. Distinctive in design and flawless in quality, they offer a tribute to the CSA factory. Then in 1958 the company appointed Robert Jefferson as it designer and he developed a whole new range of ‘studio ware’. Pictured: A Poole Studio Delphis Vase Probably By Robert Jefferson, 1961-63 Printed Mark 25.5Cm. High. Sold for £1,673 at Christies, London, March 2004. Image Copyright Christies. This was soon to become known as the Delphis range with its bright colours and individual styling. Being launched into the world of the 1960’s, the Delphis range found immediate success and helped the company maintain its market position. The delphis range was complemented by the Aegean range which was introduced in 1970. Sometimes Delphis and Agean can be difficult to identify as being one range or the other, particularly with the earlier Delphis pieces. The usual method of identification is the finer texture on the Delphis pieces and a more grainy texture on the Aegean range. During this period Cyril Carter departed, and in c1964 Carter Stable & Adams became part of the Pilkington group, and changed its name to ‘Poole Pottery Limited’. Between the Pilkington take-over and 1992 when a management buy-out took Poole Pottery back to an independant company, various other ranges of decorative wares have been produced such as Contrast, Sienna, Olympus, Domino and Calypso. The company expanded its activities around Poole with a museum and expanded into Studio Ware. However, the company wne tinto administration in December 2006, and later came out of administration in February 2007. The pottery shop remains open on Poole Quay, selling Poole pottery and the Lifestyle Range of products. There is also a studio on site, where some design work is still done, however, most production is now based at Burslem, Stoke. NOTICE – This site is not affiliated with Poole Pottery TM The purpose of these pages is to provide information to collectors of Poole Pottery.